Do you have a young man on your Christmas gift list who would love some Harry Potter gifts? He has probably read all of the books and watched all of the movies and loves everything Harry Potter. I thought I would look for some unique and different items to suggest as gifts. He most probably already has the glasses, the wand and the typical gift items that came out when the first movie hit the theaters. He will appreciate getting something that his friends do not already have, I’m sure. Some of these items can fall into the collectible category, too. If he is a real Harry Potter fan, he will know about the candies from Honeydukes and the Butter Beer. Give him something fun with a Harry Potter theme. With the popularity of the Deathly Hallows movies, Harry Potter stocking stuffers are a great way to enjoy the Christmas season. Whether you want to give candy, or just a smaller Harry Potter item, I’ve found you a whole lot of stocking stuffer Gift Ideas inspired by the movies and books. Shown here the ultimate cool Key Chain: Harry Potter – Mad Eye Moody Metal Magic Eye (Half-Blood Prince). No longer available, unfortunately. They do still stock: Mad Eye Moody Eyes! If you were thinking that a gift with a Harry Potter theme might be expensive, that is not necessarily the case. Take this simple idea for instance. A pen for their writing needs looks like Harry’s magic wand. In addition there is a bookmark of our favorite student of Hogwarts to keep their place in the book that they are currently reading. This is a great idea for a stocking stuffer and will cost you less than $10. Don’t worry it is not really beer! It is non-alcoholic, honest. It is actually a butterscotch flavored creme soda. Now here is the thing, he can choose to drink it all or he can place it in a Harry Potter collection unopened. It is his gift so he gets to decide. Oh, I just love this idea as a gift! A cookbook that has recipes of some of the favorite foods that Harry and his friends enjoyed during the series. There are over 150 recipes to make from this book including Harry’s favorite dessert, Treacle Tarts. Remember those Pumpkin Pasties on the Hogwarts cart? The Potter fan can now make them or have an adult make them for them. Besides the fun meals and desserts that can be made in any kitchen there are also facts included about several of the dishes that can be made. Even if they never make any of the items in the book, it could be a fun read all by itself. Some samples from Honeyduke’s Candy Store! A milk chocolate frog comes in a pentagon shaped fancy box. Then there is a box of Bertie Botts jellybeans to tickle his taste buds. I would recommend that he eat the confectionery treats and then save the boxes for his collection. The candy will not pass the test of time and could attract unwanted critters into his room. Before he and his friends can play the game, they have to build the set including the die they will use to play the game. There are over 330 pieces including mini figures of the characters of the Harry Potter books and movies. There is an instruction book for building the game and a rule booklet for playing the game. Recommended for ages 8 to 14 years. To encourage him to drink the proper amount of water in a day, give him this really cool Hogwarts water bottle. Actually it is a faux leather cover that zips around a 1 liter bottle of water or other beverage. It comes with one liter bottle that can be replaced with a fresh bottle each time. The zipper is a heavy duty version to withstand the continued use of a young boy. What fun gift to give a boy for his room! He can hang this on the inside of his bedroom door and pretend to walk up the stairs of Hogwarts! It is ready to be hung when you open it up. It measures 5 feet tall and 30 inches wide so it should fit just about any interior door. It can be used on an exterior door, too. It can be taken down and reused when you want, too. Are they suffering from HPSED? This book really needs to be in every true fan’s collection! It is written in a diary type format and follows the life over several years of one who is truly addicted to the stories. A fun way to pay tribute to the die hard fans all over the globe along with some insights of the individual who wrote it all down. It is funny, it is touching in some ways and truly a piece that should be a part of a collection of memorabilia. It only has 74 pages so it won’t take them long to read it, honest! If you are going to spend your relaxation time on a puzzle, this Harry Potter Hogwarts Castle 1000 piece puzzle has to be one of the most beautiful puzzles out there. A great souvenir or gift for the Harry Potter fan in the house. Recommended for die-hard puzzle fans who are also into Harry Potter as this is NOT an easy puzzle at all. There are 1000 pieces and a lot of the sky is in various shades of blue – which will make those last pieces very hard to fit in the right place. These are keychains inspired by Harry Potter – Harry Potter, Hagrid, Lucius Malfoy, Dumbledore and Hermione. Hand crafted doll made from a single flax rope. Each doll is hand decorated and adorned with recovered textiles and other detailing such as beads, buttons, and clips. Each doll has a chain to enable the doll to be used as a keychain, a mobile phone strap, added to jewelry, or any similar use like a bag accessory. The dolls can also be used as a Christmas tree accessories. As the dolls are handmade, each doll is unique and may differ slightly in size or shade of colour. The size is 2.5-3 inches approximately. Bobble Heads are cool and funny. I like them a lot. Harry Potter Bobble Heads are great gift items for individuals who are light hearted and like a good laugh. Gift one this Christmas and make your Pals smile. That’s a mouth full, isn’t it? What it is, is a cup with the marauder’s map on it. However, instead of appearing when you say a magic phrase, as in the books/movie, the map appears when you put a hot drink in the cup. And, as shown, it disappears when the level of coffee (or tea, or hot chocolate), goes down. FUN as a stocking stuffer, for instance. Harry Potter isn’t just a hit movie series, it is also a series of books that (finally) gets children to read. Somehow J.K. Rowling hit a nerve with her books – and the passion kids have for the world doesn’t end there – they want more when they finish. So if your children love the Harry Potter movies but haven’t yet read the books – make sure they get them. Reading is, after all, very important for their development and when they enjoy it, it’s really that much better. 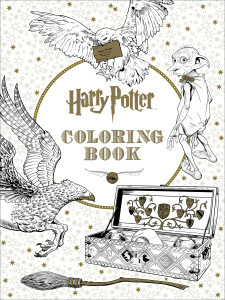 Do you have someone on your Christmas gift list that is a huge Harry Potter fan? Have you been looking for something unique and different to give to them this holiday season? You have found a good place to end your search because I have compiled a short list of some really cool Harry Potter gifts that can be given at Christmastime or for birthdays. There really are some fun things available for adults and kids alike who enjoyed reading the series of books by J. K. Rowling and then seeing the series of movies that were released. If your kids love Harry Potter as much as I do (and you perhaps) they will love these gifts in their Christmas stocking. I’ve found posters, date books, cloths etc. Most of the gift ideas on this page are dedicated to the latest Harry Potter movie: Harry Potter and the Half Blood Prince, in which Dumbledore is killed, Hogwarts changed forever and Snape publicly joins the Death Eaters. I think you’ll agree they make a great fantasy birthday or Christmas gift for your children. What did you think of these gift suggestions for the Harry Potter Fan?